Sri Lanka Blue Magpie (Endangered & Endemic), originally uploaded by Isuru Gunasekera. 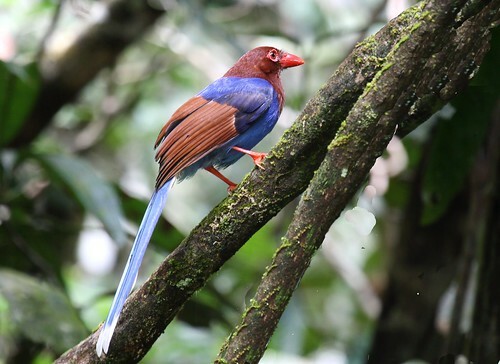 The Sri Lanka Blue Magpie or Ceylon Magpie (Urocissa ornata) is a member of the Crow family living in the hill forests of Sri Lanka, where it is endemic. This is a species of a dense wet evergreen temperate rain forest. It is declining due to loss of this habitat. Sri Lanka Blue Magpie is usually found in small groups of up to six or seven birds. It is largely carnivorous, eating small frogs, lizards, insects and other invertebrates, but will eat fruit. The cup-shaped stick nest is in a tree or shrub and there are usually 3–5 eggs laid. The eggs are white heavily spotted with brown. Both sexes build the nest and feed the young with only the female incubating them. Sri Lanka Blue Magpie is about the same size as the European Magpie at 42–47 cm. The adults are blue with chestnut head and wings, and a long white-tipped tail. The legs and bill are red. The young bird is a duller version of the adult. Sri Lanka Blue Magpie has a variety of calls including mimicry, a loud chink-chink and a rasping krak-krak-krak-krak.